On August 9th – 13th 2018, Meticuly, the leading innovative 3d prostheses provider in Thailand, held an exhibition booth at Thailand Research Expo 2018. The event, which was held with the concept: ‘Research Development for a Stronger and more Sustainable Future’ attracted research projects from all over Thailand to come together and share their knowledge and insights. 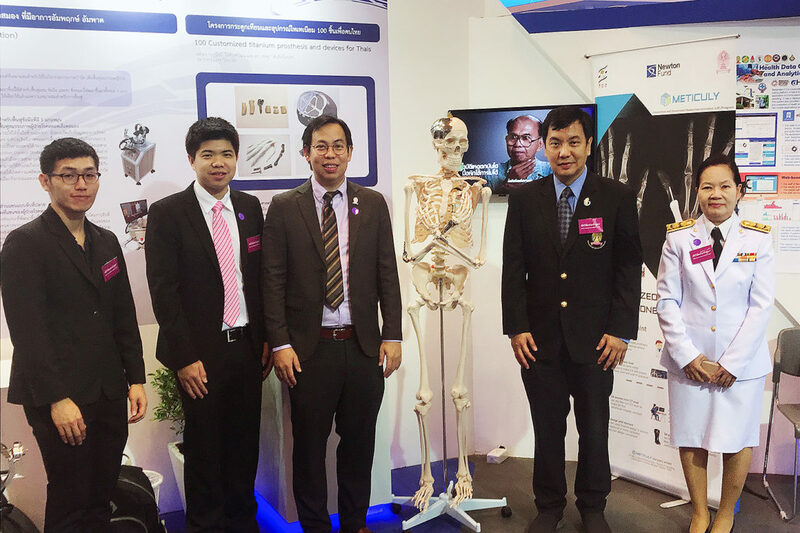 Through the Research University Network of Thailand, Meticuly was invited to participate in the annual event and showcased its latest technology in 3D printed titanium prostheses. Chedtha Puncreobutr, Ph.D, Co-founder of Meticuly, was honored to be in the presence of Her Royal Highness Princess Maha Chakri Sirindhorn to provide information when her royal highness visited Meticuly’s booth. Assist. prof. Boonrat Lohwongwata, Ph.D., also Co-founder of Meticuly, was honored with the opportunity to present a sample 3D printed cranial prosthesis to her royal highness as a gift for visiting the Meticuly booth and for supporting Thai research projects.